Let's just say…they will think of you with every bite. This gift makes gift giving easy. 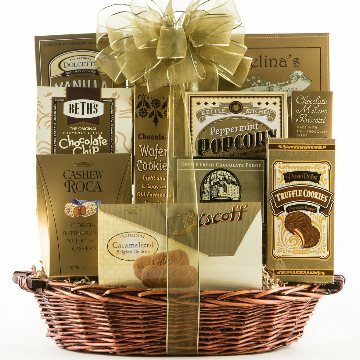 This gift basket includes the following: Kettle Fresh Chocolate Fudge, Dolcetto Chocolate Wafer Cookies, Sweet Butter Cookies, and much more. This basket makes a terrific gift for a birthday, for a boss, or for a friend. Includes: Claey's Kettle Fresh Fudge, Torani Chocolate Biscotti, Cashew Roca, Chocolate Truffle Cookies, Beth's Chocolate Chip Cookies, Biscoff European Cookies, Chocolate Cream Puffs, Dolcetto Wafer Rolls, Angelina's Sweet Butter Cookies, Classic Chocolate Wafer Cookies, Peppermint Popcorn Crunch.